Everest region trekking is not only famous for high mountains views and vistas it is also famous for festival trip, Everest Mani Rimdu festival is one of the most interesting High Himalayan Buddhist festivals observed every year, it is celebrating in Tengboche monastery it is an old Buddhist monastery located in Everest region of Nepal. In Tengboche the Mani Rimdu is performed usually between mid-October and mid-November, the date of the Mani Rimdu festival is fixed according to the Tibetan Lunar calendar and announces the Mani Rimdu festival dates by the head of Tyangboche (Tengboche) Monastery Lama. The Mani Rimdu is a colorful festival which is not only popular in Nepalese people, also lots of tourists visit in Nepal to see this colorful festival at Tengboche monastery each year with their family and friends. Tengboche monastery is in on the way to Everest base camp trekking so people can make Mani Rimdu festival with Everest base camp and Kala Pattar trek too or those who have short time they just make a trek to Tengboche monastery to observe the Mani Rimdu festival at Tengboche monastery. Our below given itinerary just to designed go for Mani Rimdu festival but if you like to make festival with Everest Base camp, Gokyo Lake or Cho La Pass trekking just inform to us for new itinerary. The dates of Mani Rimdu festival for year of 2019 is November 12th, 13th and 14th. 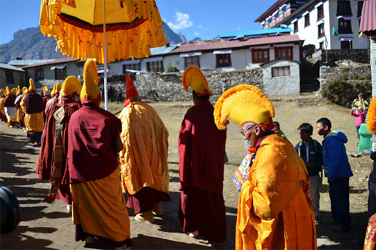 12 Nov 2019 Day 07: Mani Rimdu festival at Tengboche Monastery. Wang - blessing ceremony. 13 Nov 2019 Day 08: Second day at the festival. Witness the Cham - mask dance. After 45 minutes fly from Kathmandu to Lukla and will have breakfast and then continue our family journey passing many Buddhist monuments during the trail and finally we reach in Phakding which takes about 3 hours. We will have lunch there. Evening time, we go for village tour with our guide. Overnight in Lodge. In the morning after breakfast we start from hotel and we reach in Monjo after 3 hours walk passing many suspension bridges with good view of Mt. Thamserku and we should entry our permit and will have lunch in Jorsalle. Then we start to climb steep up slowly passing high suspension bridge till Namche Bazar which takes about 2 and half hour. We have a great view of Khwangde Range and Thamserku. Overnight in Lodge. In this day, we will hike to Everest view hotel for panoramic and spectacular view of mountains. It takes 2 hours to reach there and enjoy the view of the mountains. Then we climb down to Khumjung village for the visit monastery and Khumjung Hillary School. It takes about 1 hour. We can see Skull of Yeti inside the Monastery. This is the biggest Sherpa village in Khumbu region. Again we continue our trek to Khunde village which takes about 1 hour. We will have lunch there and visit the old monastery and Khunde Hospital. We come back to our hotel in Namche via Syangboche village. It takes about 1 and half hour. Overnight in Lodge. In the morning, we start our trek like the day before. The level trail continues till reaching Kyanjuma village and takes about 1 and half hour. Then it climbs down to the Dudh Kosi River and crosses a suspension bridge. We can see a series of picturesque water driven prayer wheel. Then we will have lunch in Phungi Thangna. The steep ascent brings us to Tengboche village. We can visit the monastery in the evening. The views of the mountains, Sunrise as well as Sunset are spectacular in the morning and evening. Overnight in Lodge. Day 07: Mani Rimdu festival at Tengboche Monastery. Wang - blessing ceremony. Day 08: Second day at the festival. Witness the Cham - mask dance. This day after breakfast, we return back same way to Namche bazaar. Firstly our trail steep descents to Dudh Kosi River and again trail ascent brings us to reach Kyangjuma village and it takes 3 hours. We will have lunch there. After lunch the trail continues straight until reaching Namche and takes about 2 hours to reach. Overnight in Lodge. In the morning, we will leave the Namche Bazar and trail descents through pine trees and cross the high suspension bridge over the Dudh Kosi River. Then our trail continues River side and we arrive in Jorsalle and it takes about 2 and half hours. We continue again our trek until reaching Phakding with crossing several bridges about 1 and half hours walk. We will have our lunch there. After lunch our trail continues until Lukla with passing up and down which takes about 2 hours. Overnight in Lodge. Lukla get occasional flight delays during the main season. This may cause missing your international flights as well so we recommend you to prepare accordingly. Lukla suffers from quick weather changes and that may affect inbound and outbound flights. We reserved this day for possible flight delays. In case we have timely flight on DAY 14, we can use this day as rest. We can shop around local markets and walk around the city. We will drop you at the airport by our private vehicle according to your airport time. It is recommended to reach the airport at least two hours prior to departure. The set departure dates listed are specially quoted and specified for group joining option. If above fixed departure dates are not suitable to you it is possible to schedule your own departure dates and also possible to modify the itinerary and upgrade the service Budget to standard and deluxe tour as per your requirement. If above trip itinerary that doesn't suit to your holiday schedule or you wish to modify the itinerary or combines with any travel plans, then please let us know and we'll be happy to create a tailor made itinerary, designed and departure the trip any date that suitable to your holiday schedule especially for you. Please click here for tailor made trip form.